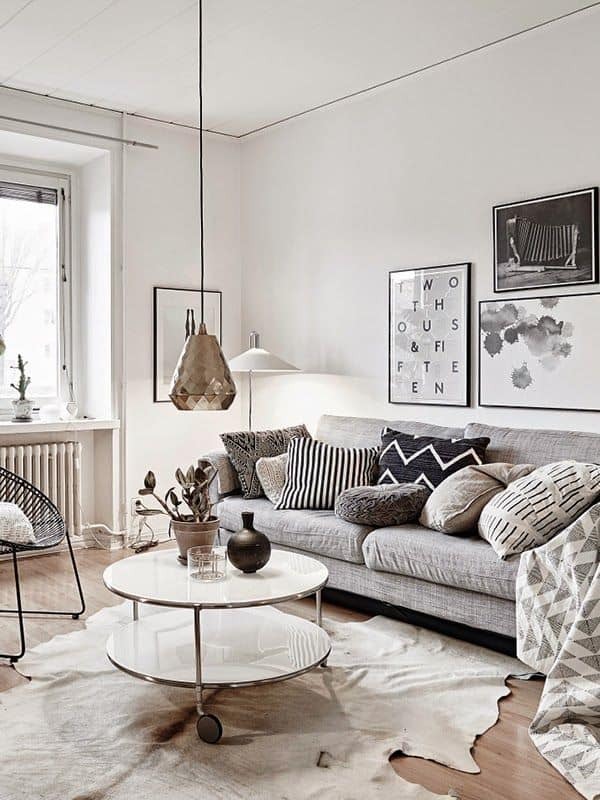 Scandinavian-inspired design is all about clean lines, functionality and light, muted tones, plenty of texture for added warmth and pure simplicity that is visually pleasing. 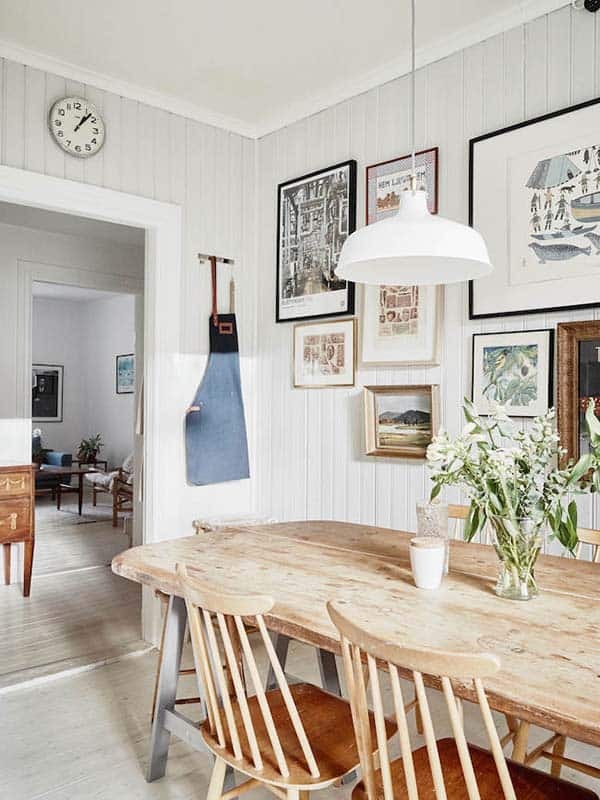 Drawing light into the home is very important to Scandinavian interiors, in this time zone the sun goes down early, so keeping the light in is integral to the design scheme. 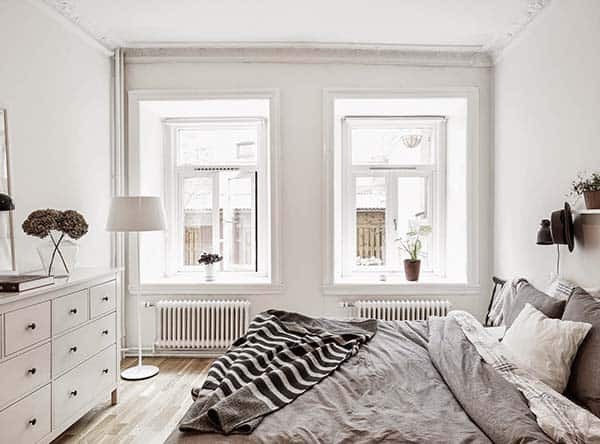 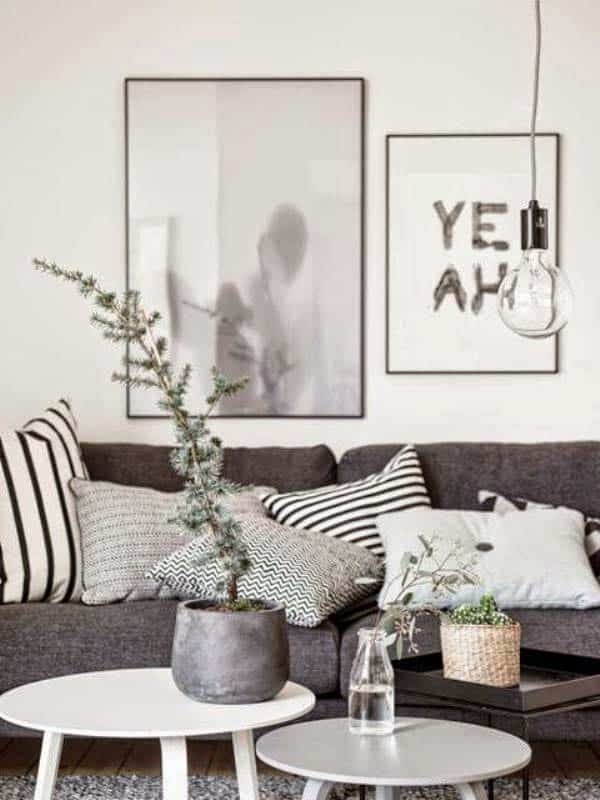 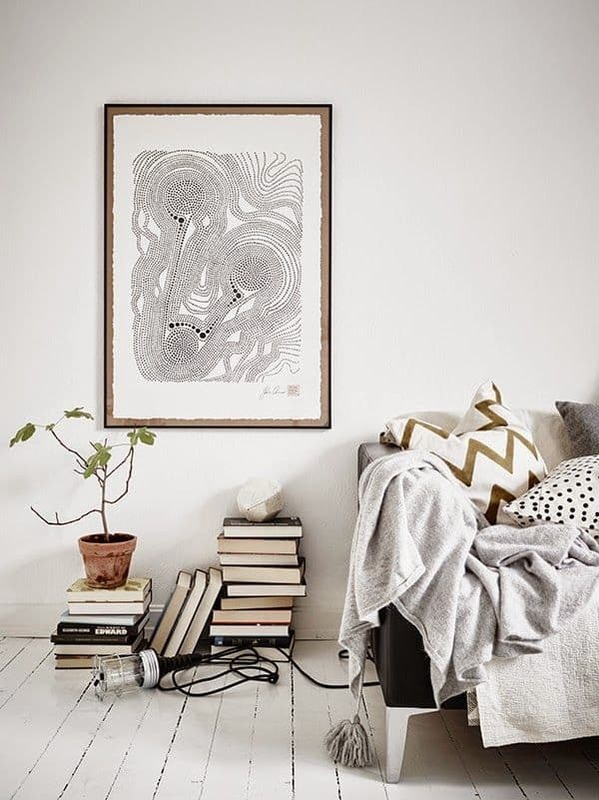 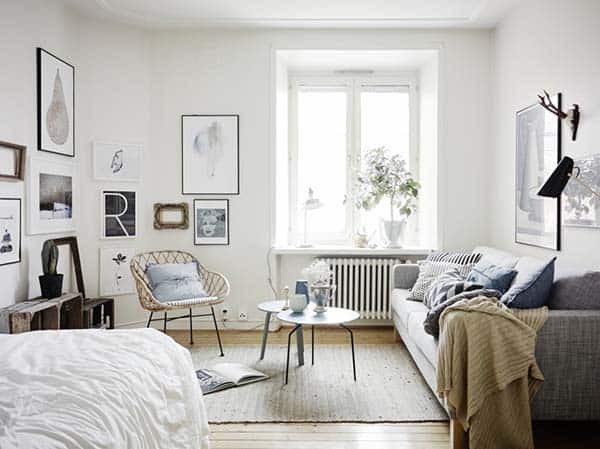 Minimalist, budget-friendly ideas is always welcome in a Scandi home, you will see a lot of Ikea, clever DIY ideas, minimal ornamentation, plants used as decorative accessories and typically crisp white walls that are decorated with interesting art work (gallery walls are a must!) 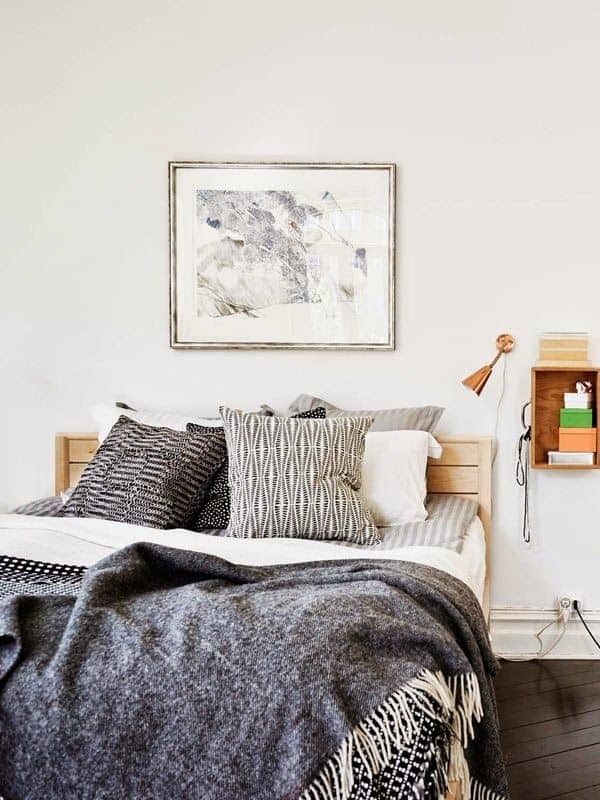 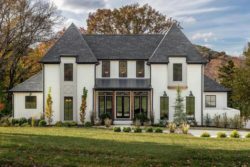 Coziness is also an important concept to capture in a Swedish style home, with the use of fur pelts, throws, textural pillows and area rugs and a fireplace, typically wood burning, is definitely helpful on chilly nights. 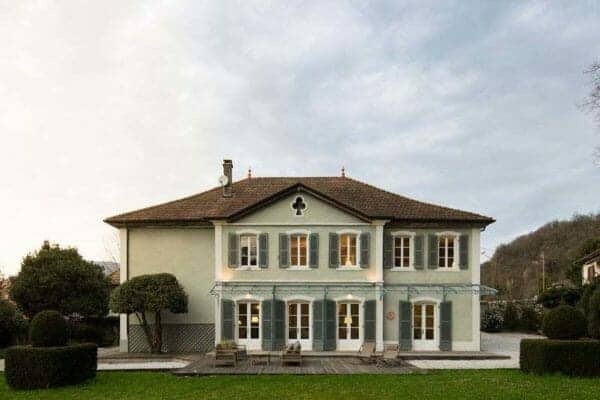 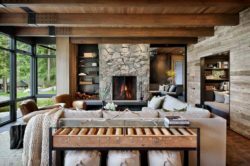 If you don’t wish to have a functional fireplace, or live somewhere where it is always temperate, a fireplace can still be used just for show. 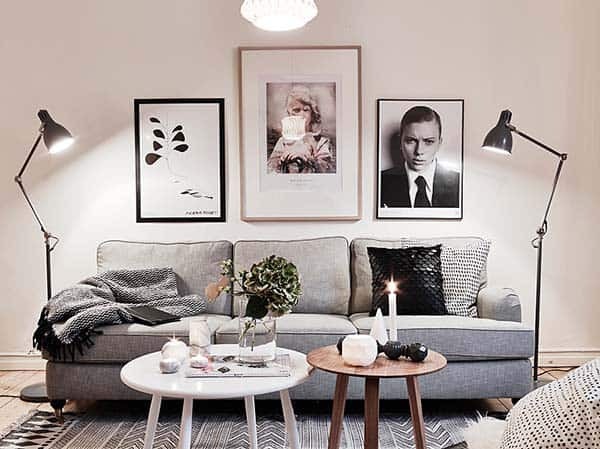 Add candles into the fireplace for ambient mood lighting. 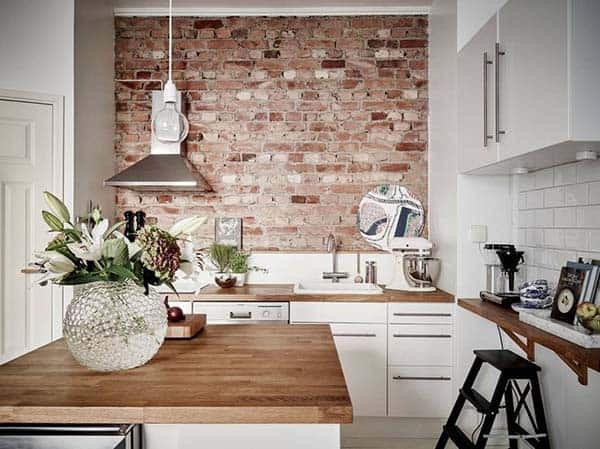 Other material elements that are typically found in a Scandi interior includes wood plank flooring, exposed brick and floral wallpapering. 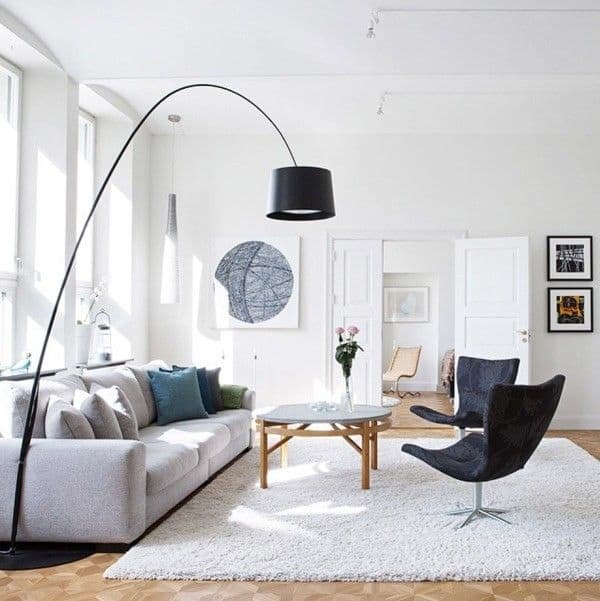 Form and function are important concepts to keep in mind when designing your interiors with Scandi-inspired design. 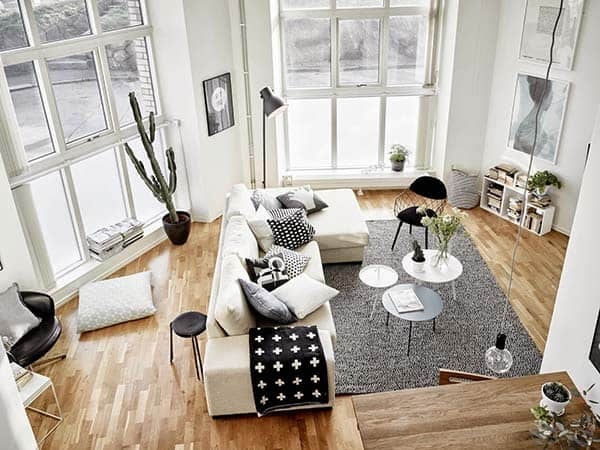 Applying clean lines in your space, from furnishings to the architecture. 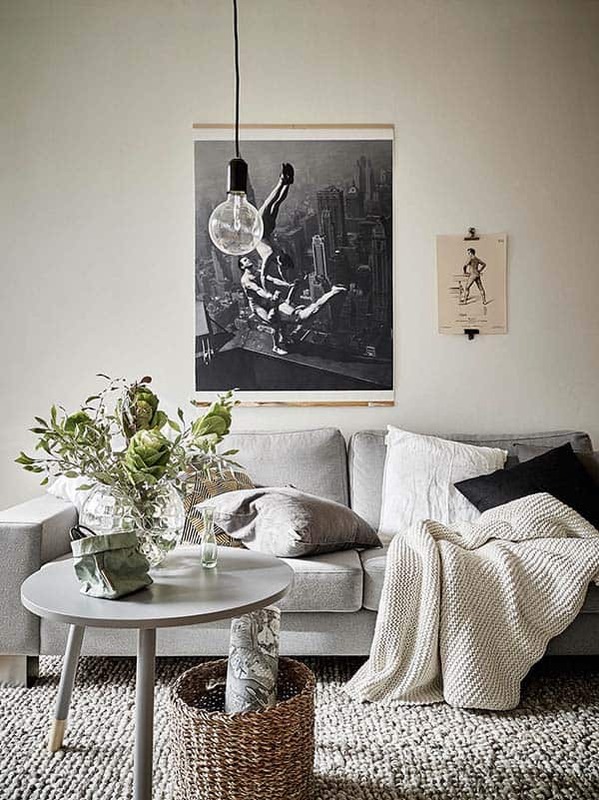 This space is very livable, from the cozy sofa to the plush pillows and textural area rug. 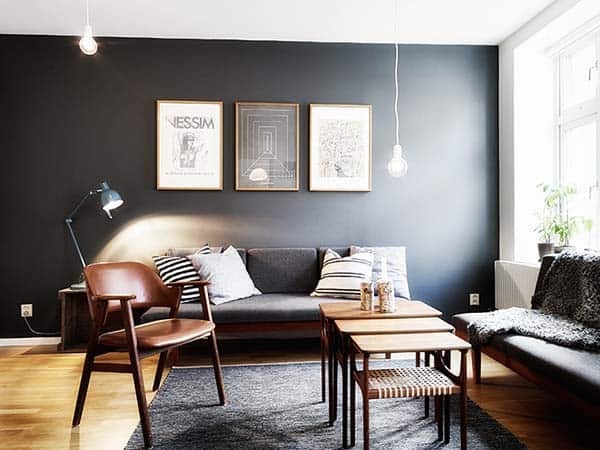 Scandinavian interiors will typically have wood plank flooring, usually in a light color that is found in all rooms except for the bathrooms, which have tiling. 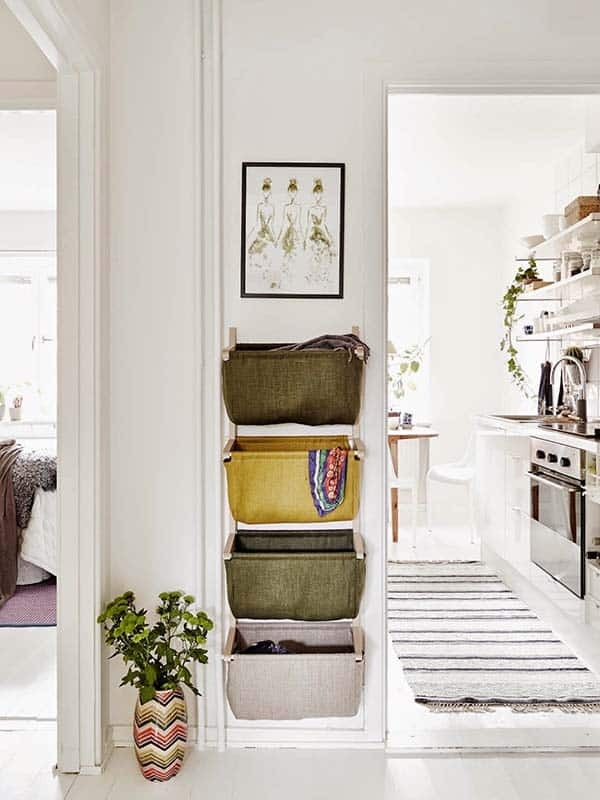 Clever design solutions such as wall hanging storage baskets are key to successful Scandinavian design. 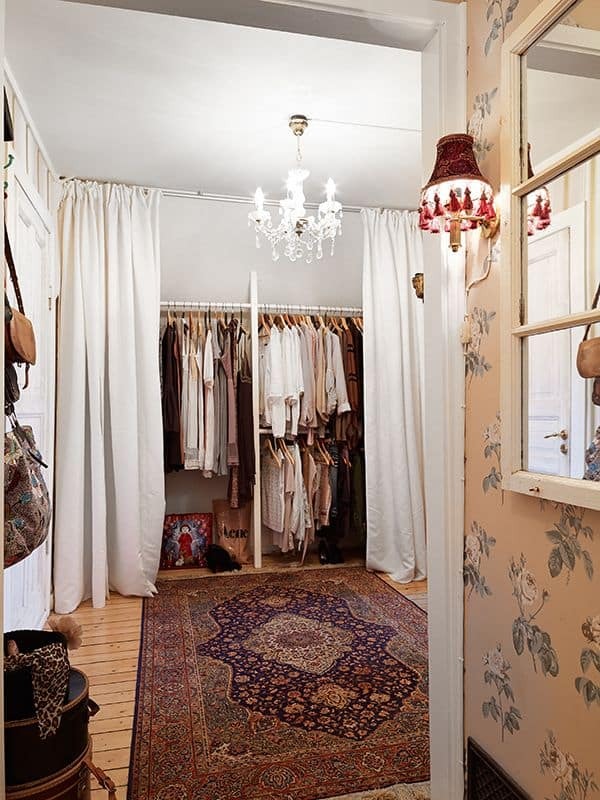 This helps with organization and helps prevent a small space from getting cluttered. 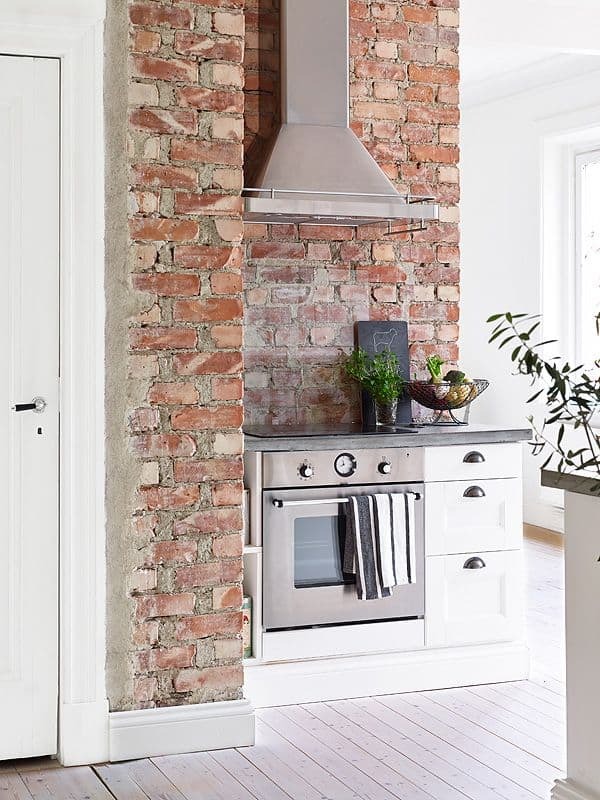 Exposed brick in the kitchen creates an eye-pleasing material element. 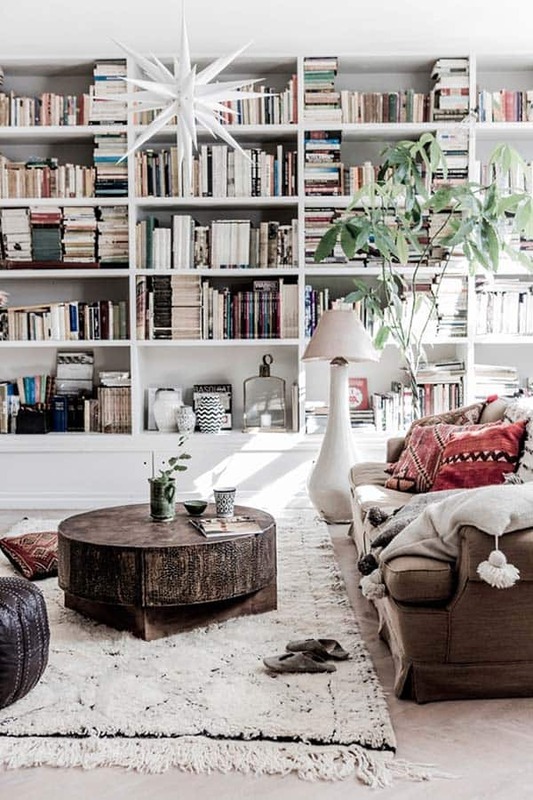 A living room in a loft features a vintage Moroccan area rug that really pulls the space together. 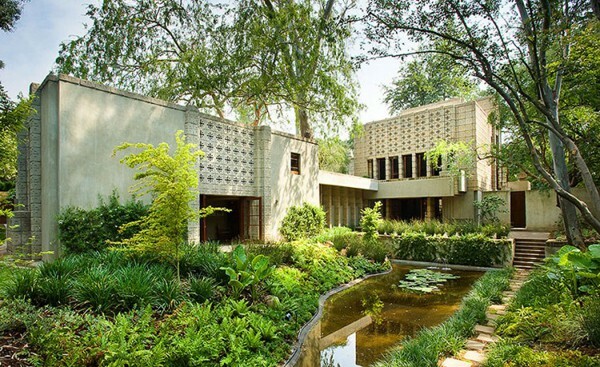 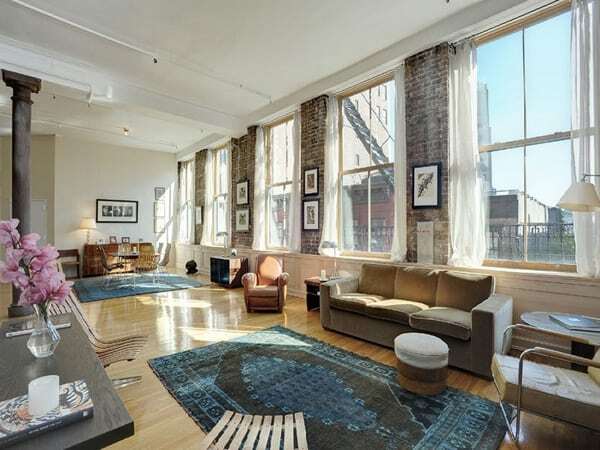 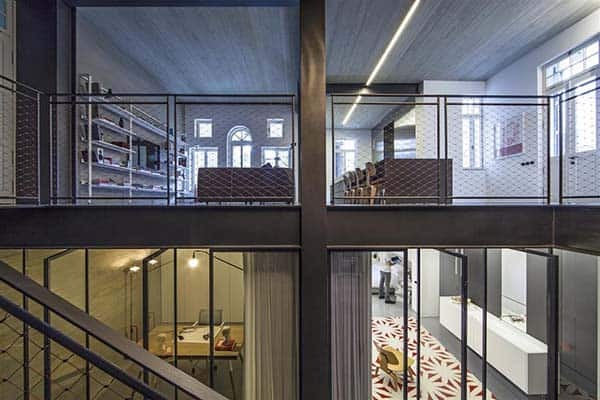 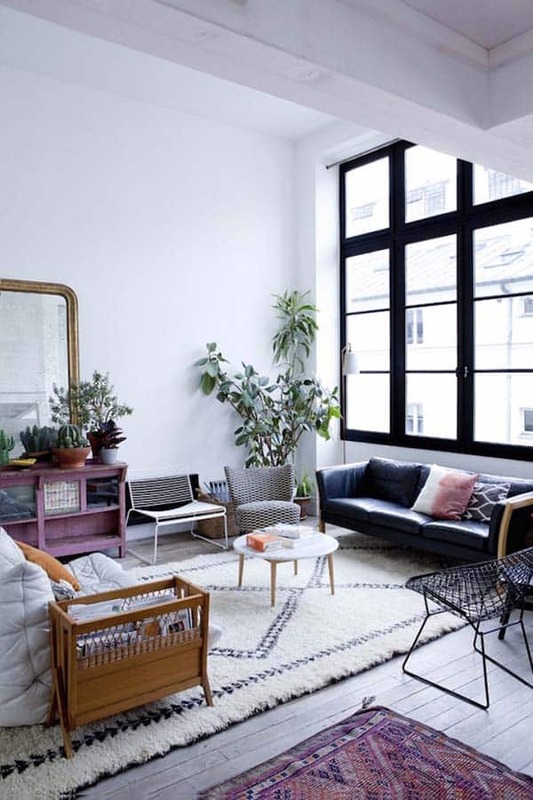 Large windows illuminates the space, making it cheery and bright. 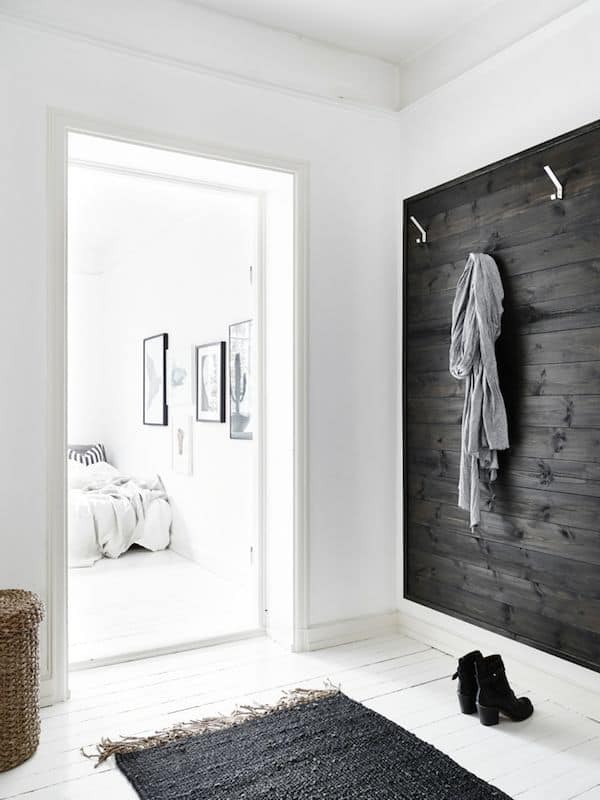 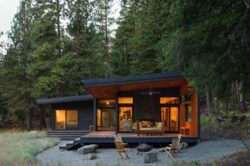 Use wood to clad the walls or even the ceiling to add texture, color and warmth. 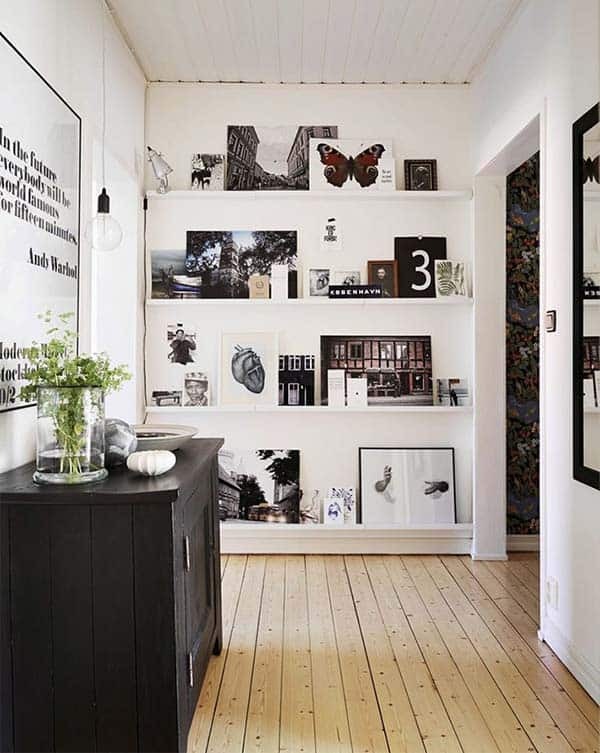 Here a clever DIY idea highlights a small wall in the entryway to add some contrast to the otherwise white walls. 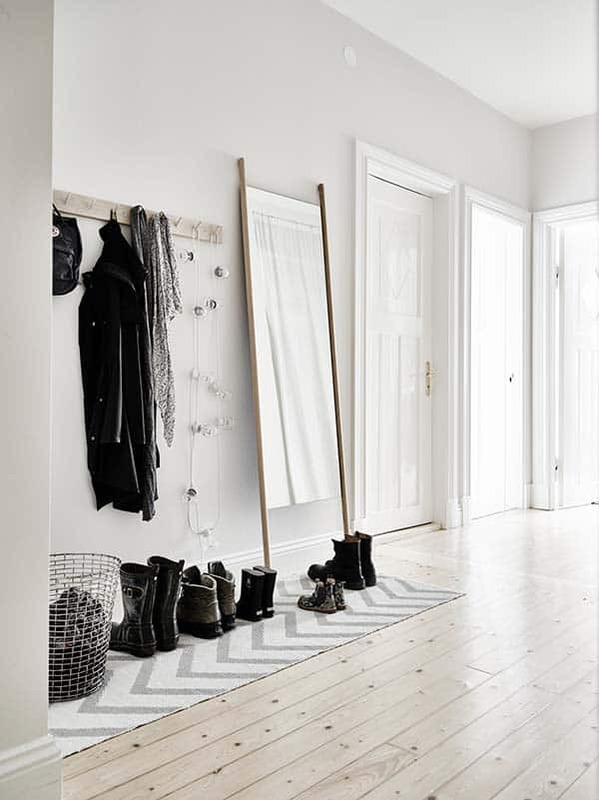 Simple hooks on the wall makes up for the lack of a front entryway closet in a small space and creates a great area for hanging coats or sweaters or even a scarf. 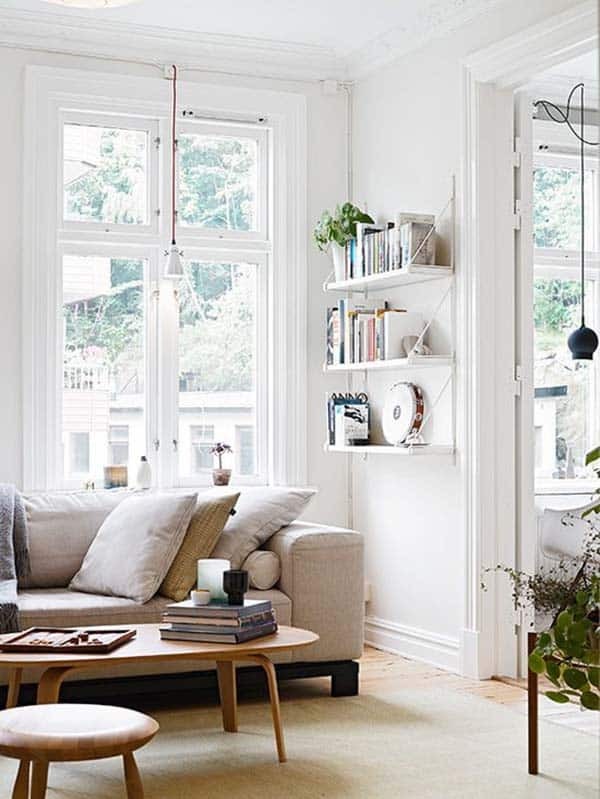 A fireplace in a living room adds warmth and coziness to the space (baskets of stored wood for accessibility are also a clever idea if you do not have a built-in niche). 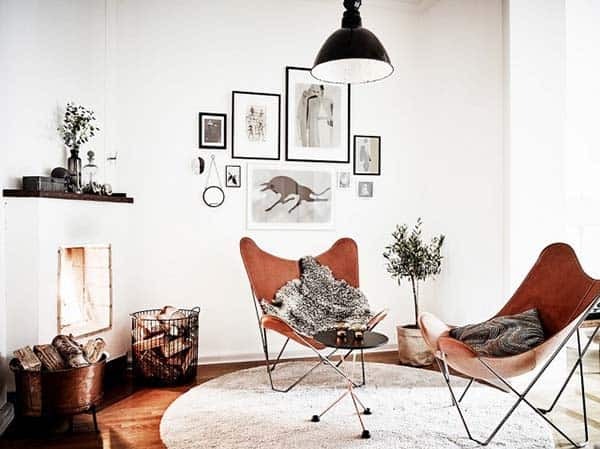 In Scandinavian living rooms, fireplaces are usually in the corner, not always made to be the focal point of the space, but do add much needed warmth to the harsh winters that Swedes experience. 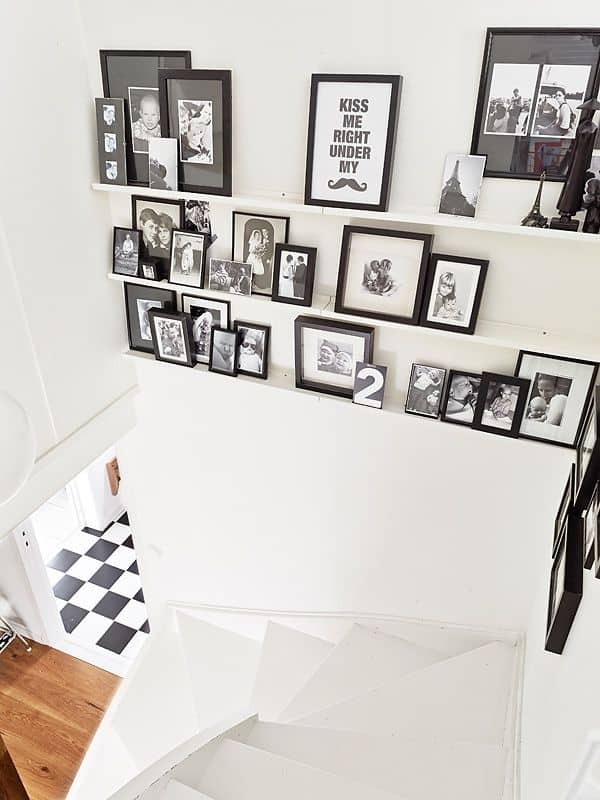 A novel idea in an empty space in your hallway that needs a little extra something would be to lean a wooden ladder against the wall. 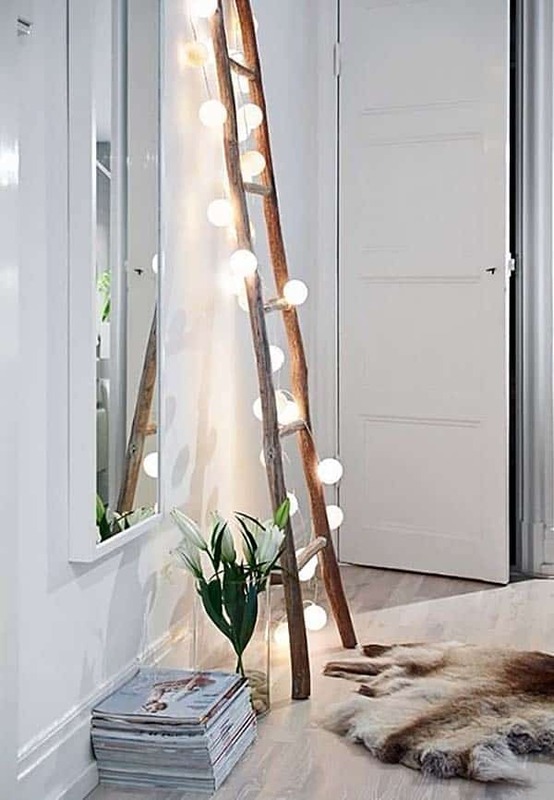 Be sure to place it near an outlet so you can wrap it with string lights for some ambient mood lighting. 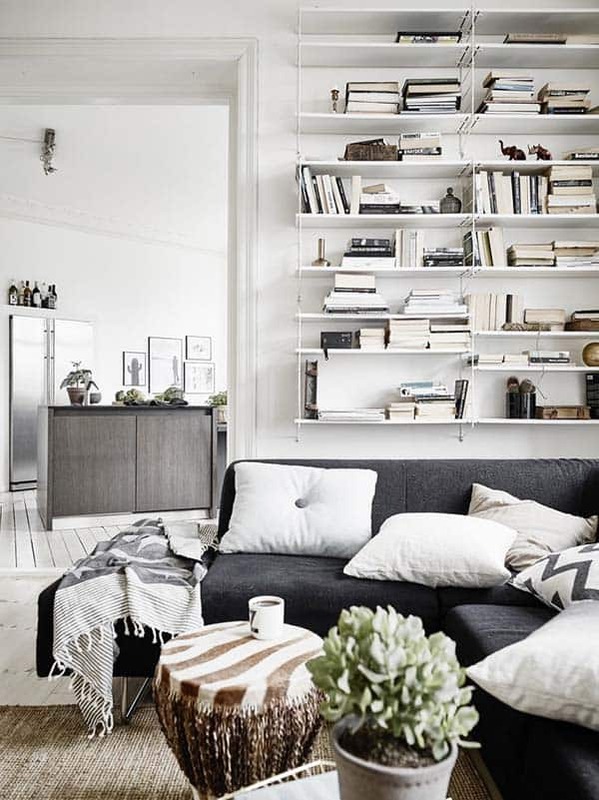 Built-in bookshelves provides functionality and a nice space-saving feature. 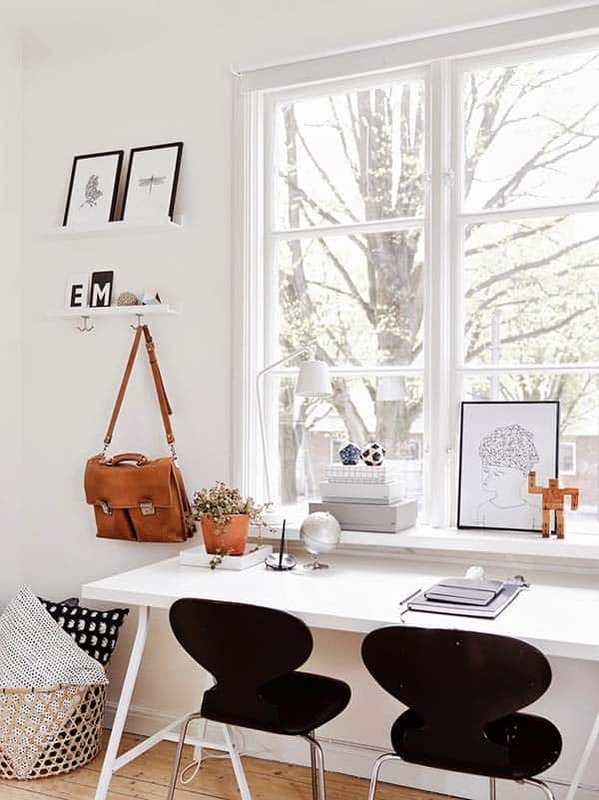 You can decorate the shelves with not only books, but personal accessories as well, such as photo frames, vases, candles, etc. 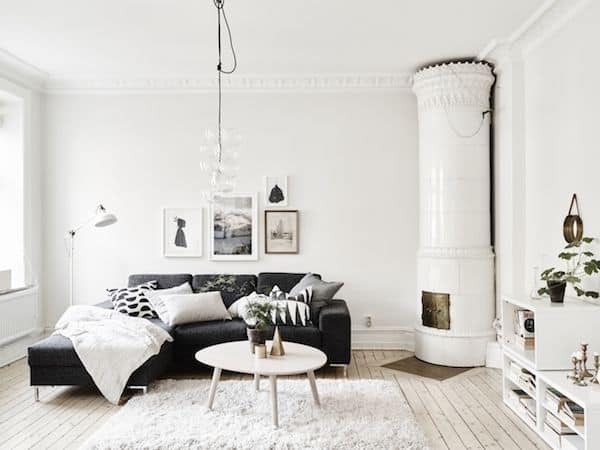 An original 19th century fireplace in the corner of this sitting room has beautiful architectural details. 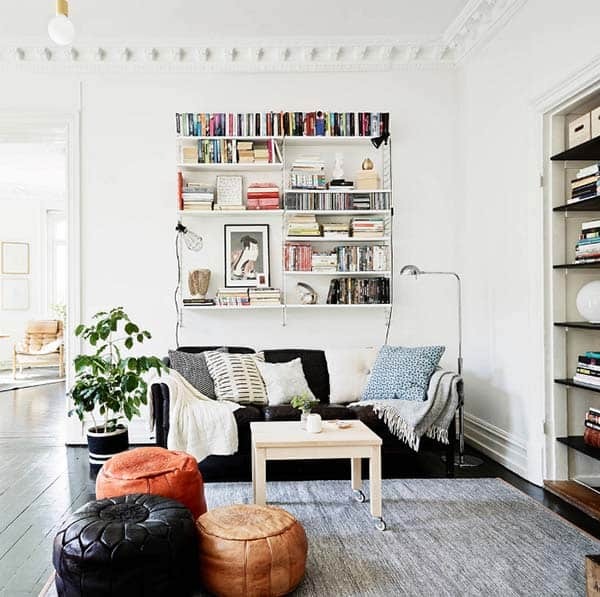 Another architectural element characteristically seen in Scandi homes is intricate crown molding. 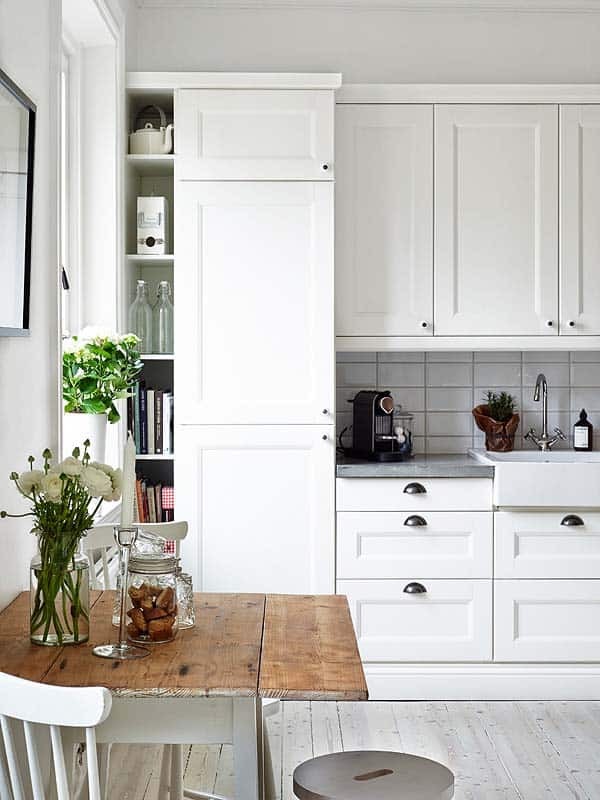 Adding paint is an inexpensive way to change-up your space and add a new aesthetic. 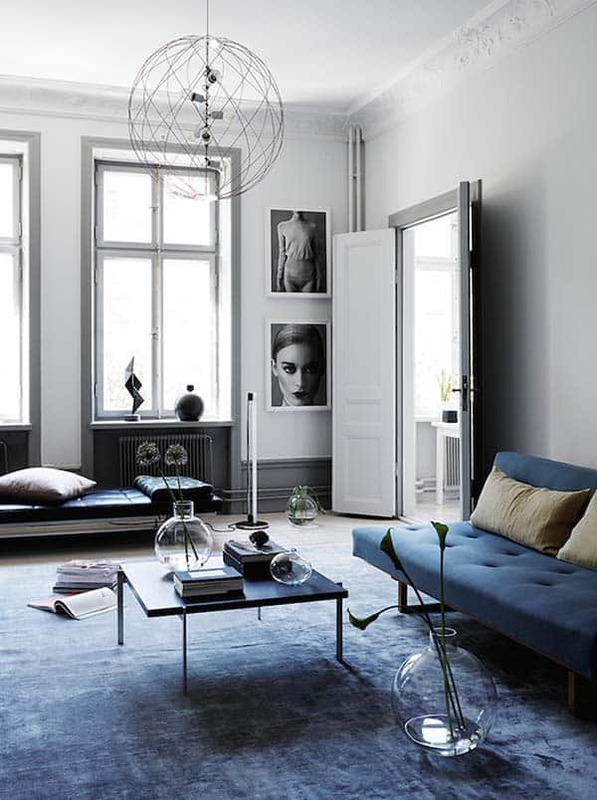 This charcoal hued accent wall creates a dark and moody living room that is perfect for a gallery wall, really helping to set off the artwork. 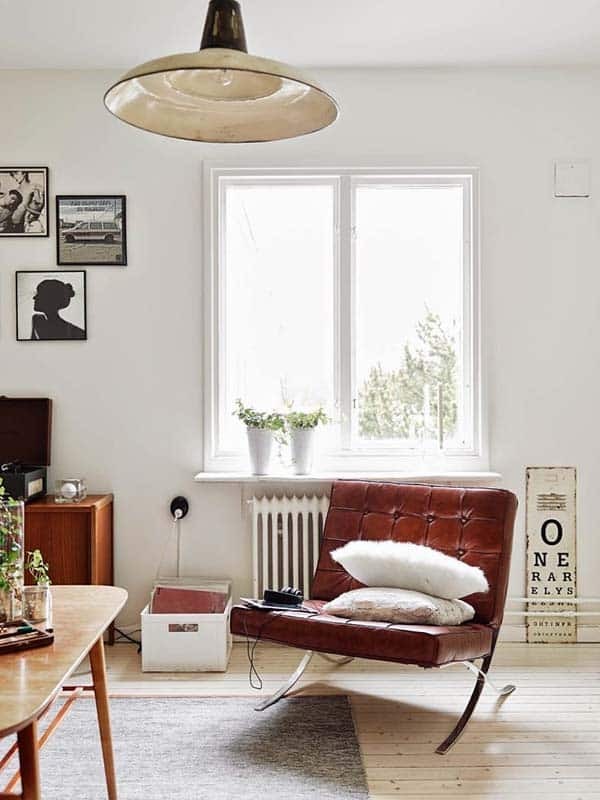 Another favorite with Scandinavian design is the inexpensive light fixtures that actually look really cool and can create a unique statement piece, a work of art in their own right! 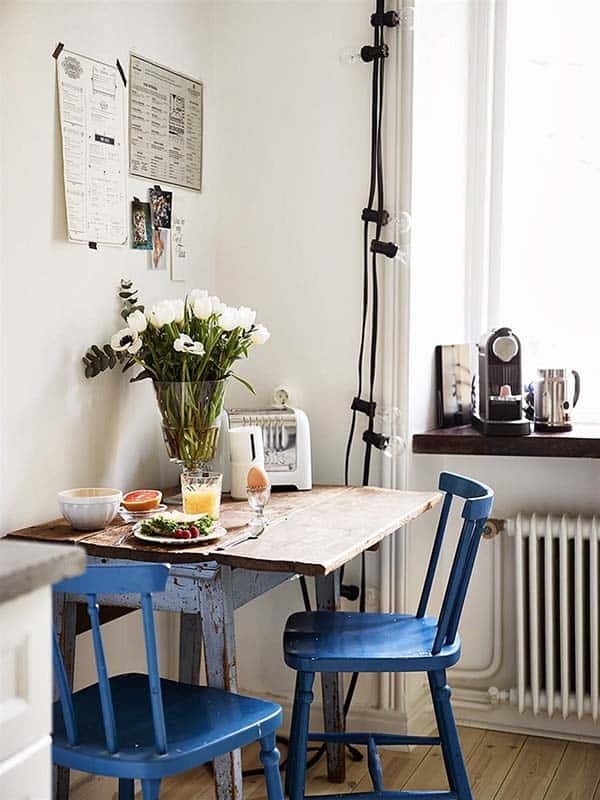 A budget-friendly idea, purchase inexpensive chairs from a flea-market or vintage store and re-finish them in an eye-catching hue, like the cool blue color in the picture above. 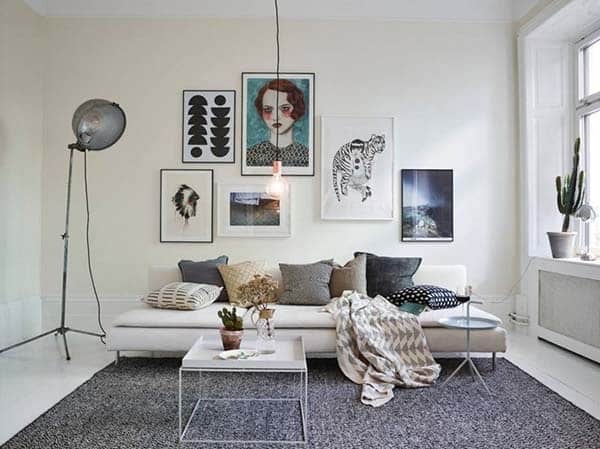 This adds a nice pop of color to an otherwise white space. 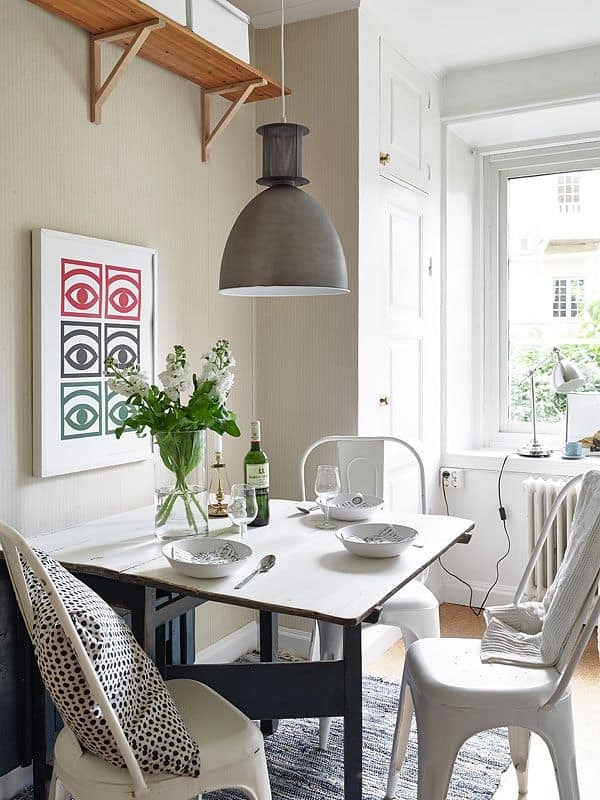 An old dining table completes the look, which is another great DIY idea. 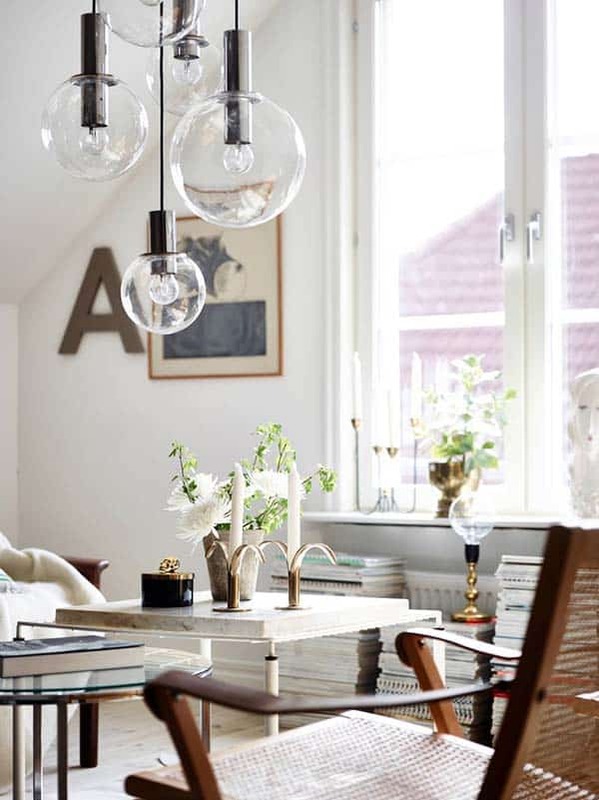 The piece above has been made to look weathered, very chic! 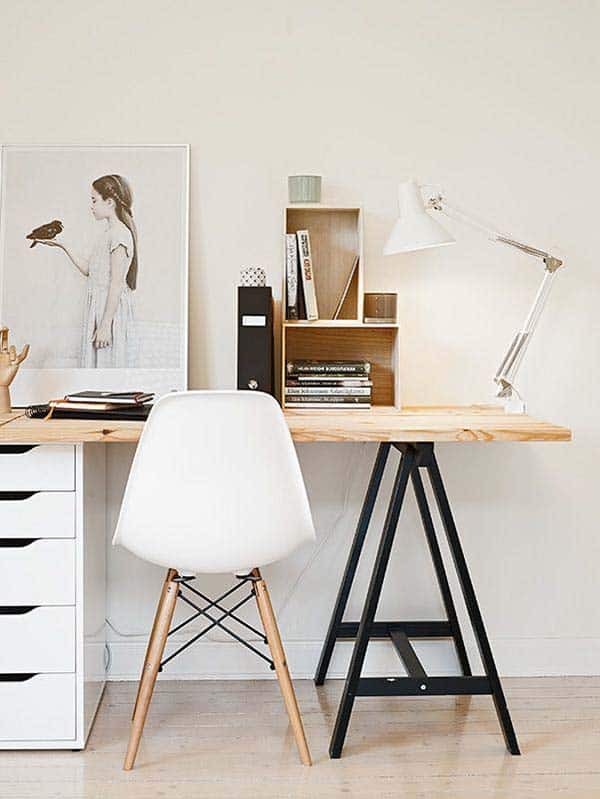 A folding table top is perfect for small spaces, the table size can be increased when company comes to visit. 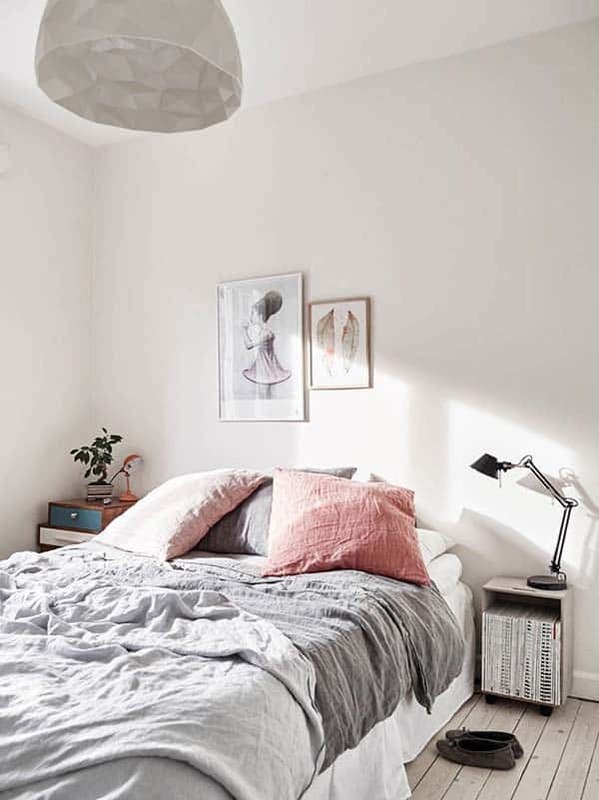 Shelving on the walls above the bed makes a nice substitute for a headboard. 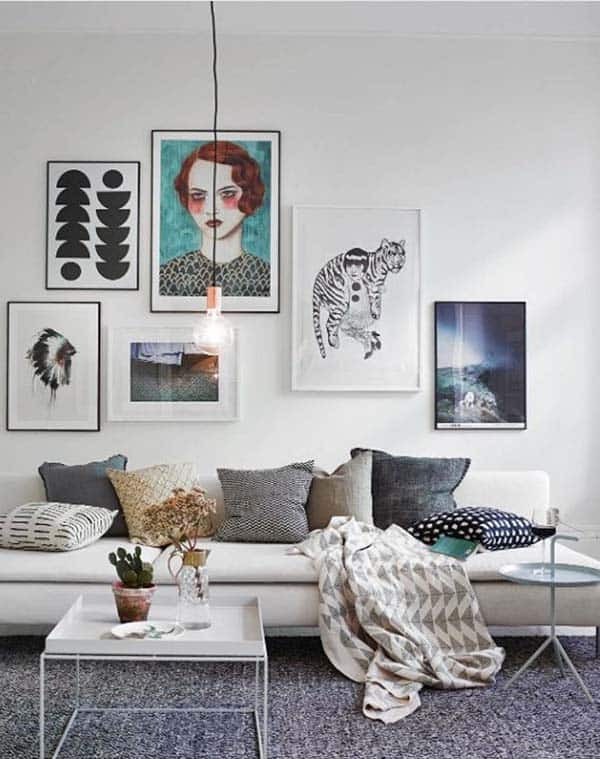 Decorate it with your favorite prints to create a nice gallery wall that you can be proud of! 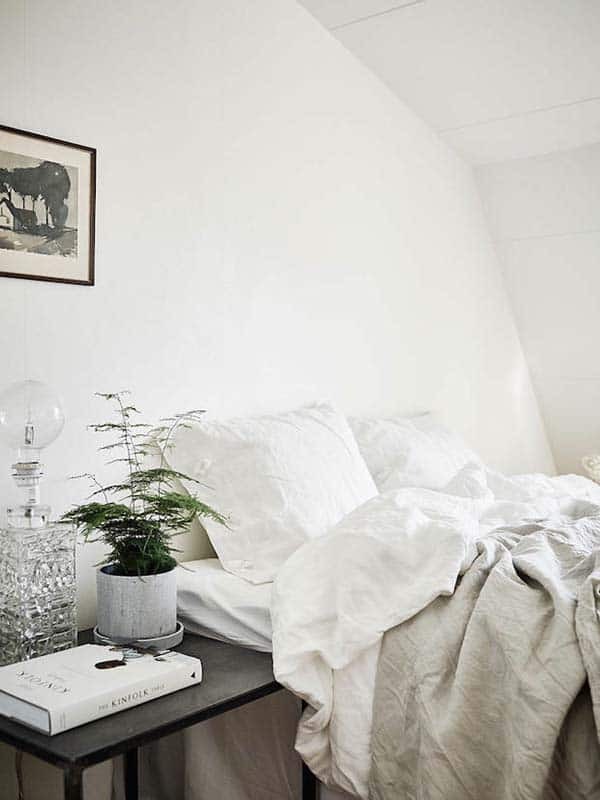 Plush, cozy linens are always a mush in Scandi-inspired design. 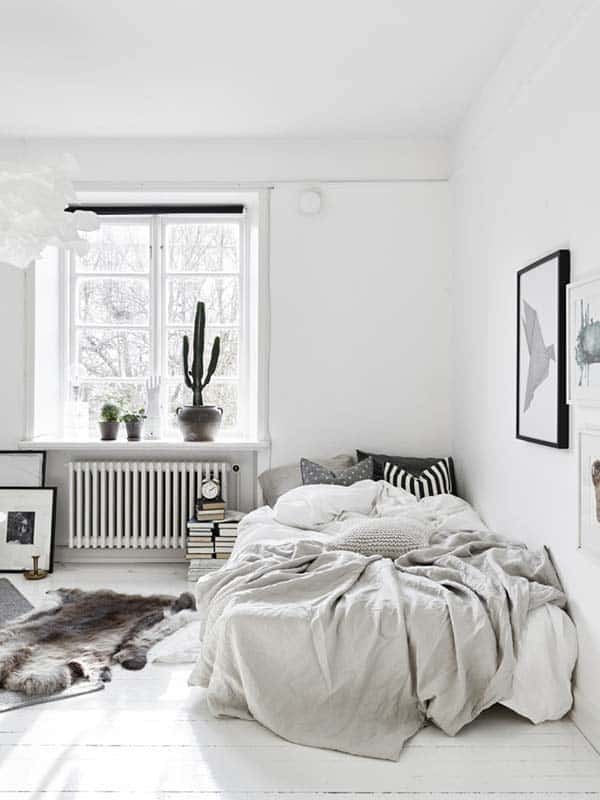 Crisp white walls, light flooded interiors and cozy pillows and fabrics…and don’t forget the fur pelt! 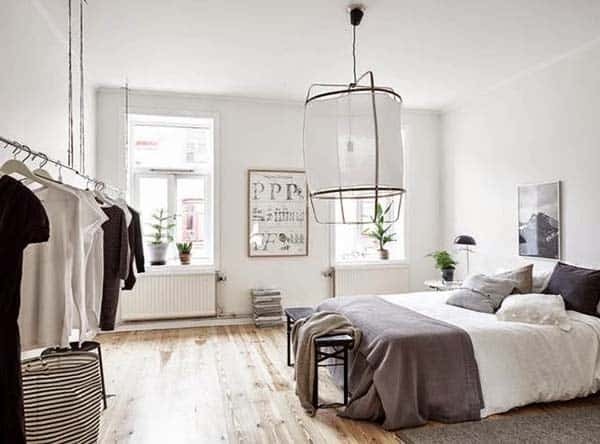 The bathrooms are typically the only space in a Scandinavian design scheme that do not have wooden flooring. 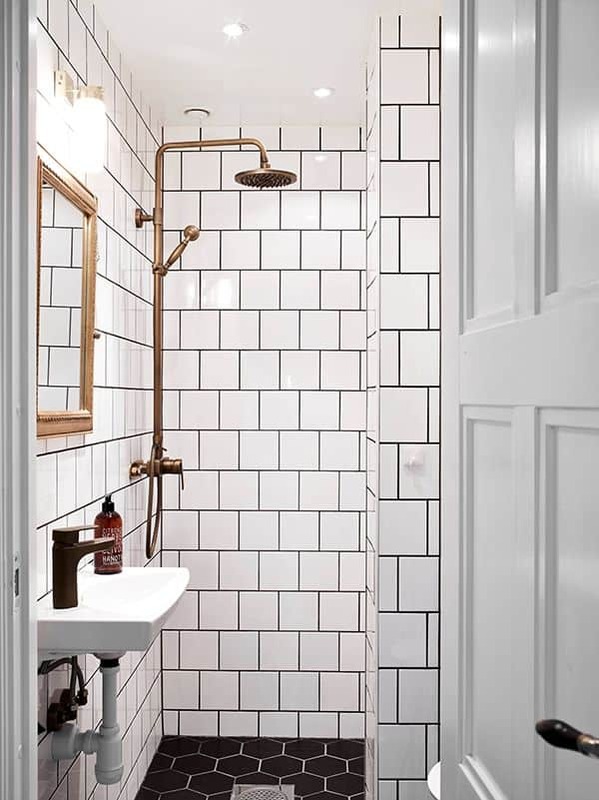 Subway tiles are very popular, and the black hexagonal tile on the floor contrast nicely with the white subway tile clad walls. 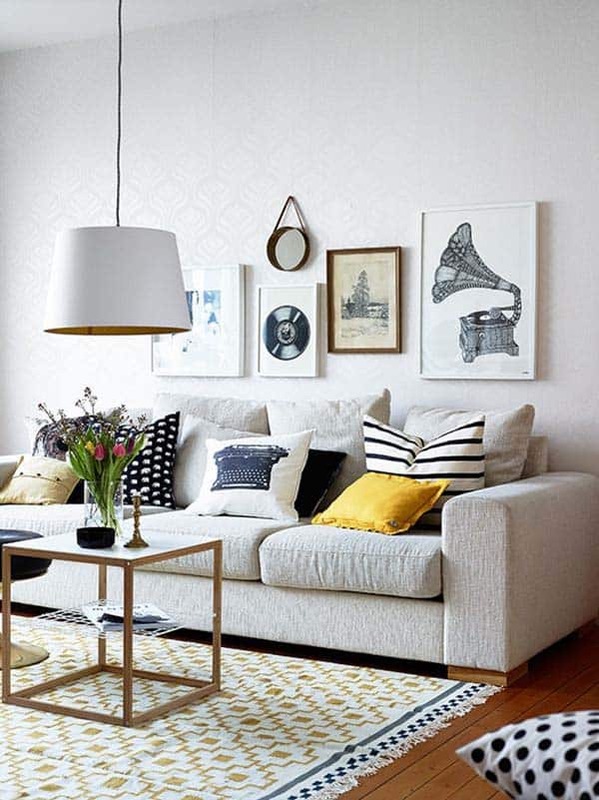 Gold fixtures and mirror sets off nicely against the white backdrop. 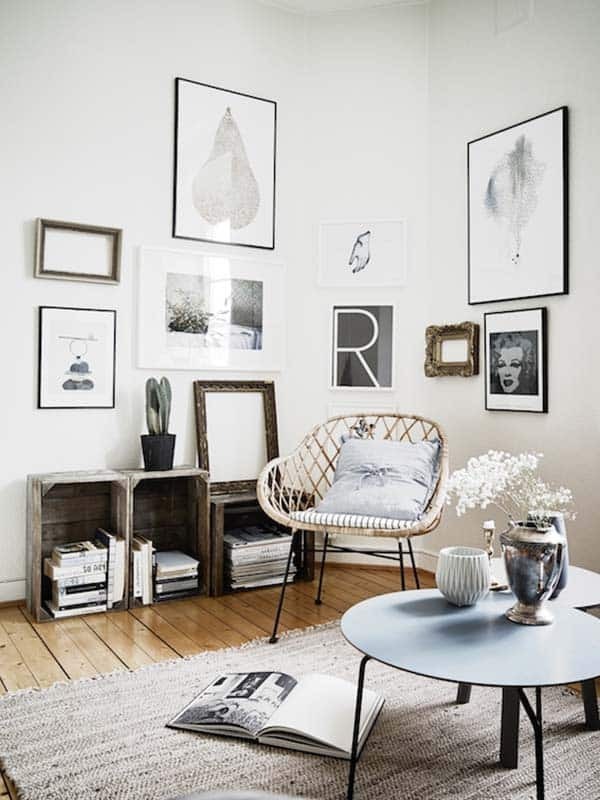 An open space in a hallway takes advantage of some simple shelves to create a gallery wall layered with various sized prints.